BYU fans are often vocal while supporting their favorite football team, and Dreyer’s Ice Cream, in conjunction with BYU, has found another way for fans to use their mouths—by eating Cougar Craze, a new limited-edition ice cream offered during football season. A portion of the ice-cream sales support BYU scholarship funds. Available through November in more than 300 stores in Utah, Nevada, Wyoming, Colorado, and Idaho, Cougar Craze is a confection of vanilla ice cream with fudge swirls and caramel-filled footballs. BYU is one of 23 universities nationwide who participate with the national ice-cream company during football season. The University of Utah is also a participant, and deep-blue BYU-branded cartons will sit alongside red containers on grocery store shelves as a reminder of the schools’ traditional rivalry. The back of each container contains BYU’s 2005 playing schedule as well as information about Dreyer’s “Scoop for Scholarships” program. 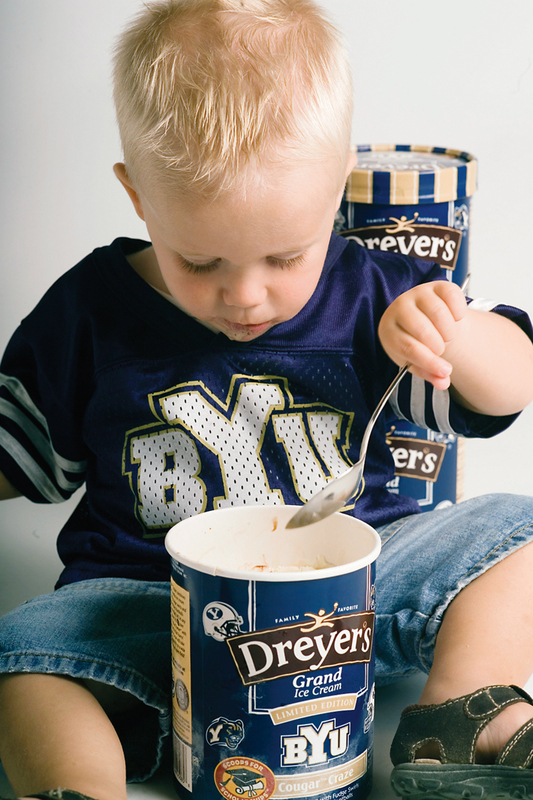 For every half-gallon purchased, Dreyer’s will donate a dollar toward BYU scholarships, up to $2,500. Brett F. Eden (BA ’99), the director of BYU trademarks and licensing, says BYU expects to expand its branded food offerings this fall with BYU cinnamon bears, taffy, potato salad, honey mustard, and barbecue and steak sauces.